“In short, landscape is the link between our outer and inner selves”. Bill Viola’s words have crystallised something for me. They connect many of the strands that seem to crop up in my work… the experience of the body, of time, of the landscape as a physical thing. The body as conduit of the experience (simultaneously) of time and landscape, the body as a landscape in the frame. Or rather, I don’t know if these things are apparent in my work, however, they are things which inform the choices I make. As well as the sight of landscape, the sound of landscape enters the works. The sound of the rain and the wind in Snöplog. And Figure(s) became a sound piece – a “sculpting of time” (Viola again) through sound, object and body – falling beans alluding to waves, pebbles and the time of landscape, of the body, not of the mind. At once energetic, totemic, classical, abstracted (some more than others) and celebratory. This is a description I wrote of some of Henry Moore’s Reclining Figures that were exhibited in the gardens at Hatfield House during the summer of 2012. 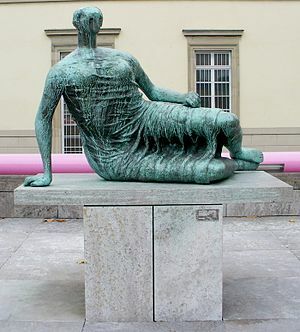 The figures, mostly female, are reclining, however they emanate both a sense of groundedness, their totemic limbs firmly planted into the floor (or the plinth), and a feeling that they are just on the brink of movement. Looking at other classical representations – in the Western art tradition – of the female form, Titian’s Venus of Urbino, Gotzius’ The Sleeping Danae Being Prepared to Receive Jupiter, I notice a softness and fluidity of form that contrasts the energy and strength in the Moores. Taking this contrast as a starting point, I wanted to investigate how these two physicalities both feel – to embody them – and look. How might sound score the sculptural body, and the sculpting body score sound? The relationship with a soundscape/or score, or the idea of scoring the sound on/with the body has something to do with the materiality of Moore’s forms and their weight, of the potential energy and movement in them, contradicted by their weighted still nature as bronze, or stone. In an early conversation with artists Vv and Jennie Howell, we talked about finding a way to express the “resonance of mass”, its “sonic weight”.